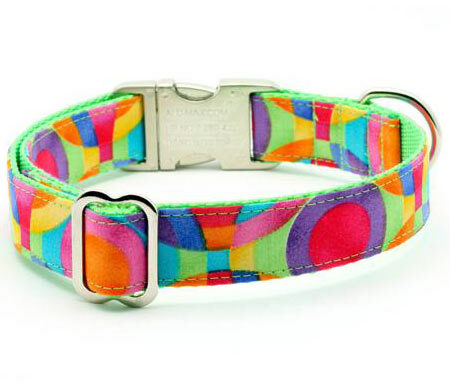 Hot, flashing colors make this dog collar really pop! 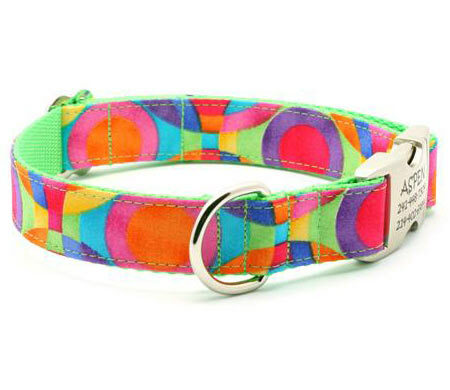 Designer dog collar Aspen, in popping bright colors. Personalized with a custom engraved buckle. The Aspen, bright, colorful, popping colors! 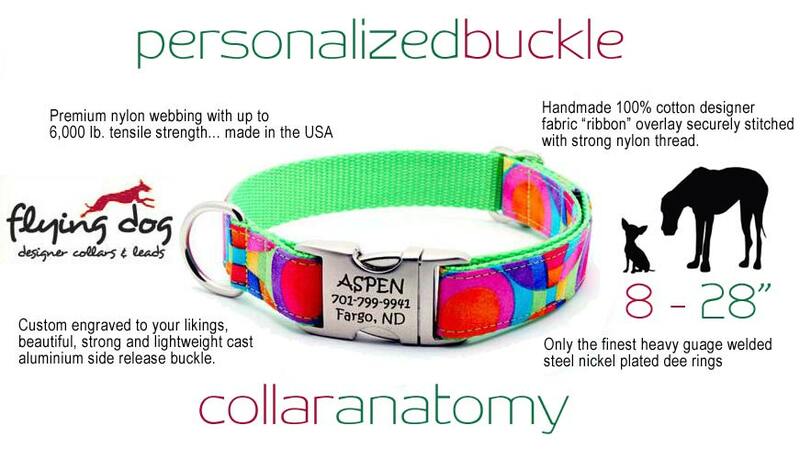 Personalized dog collar with a custom engraved buckle. with personalized buckle, hot colors! The Aspen is perfect for the summer with its bright geometric pattern. Red, blue, purple, pink, yellow and lime green in and overlapping circle pattern set against super bright lime green industrial strength nylon webbing. 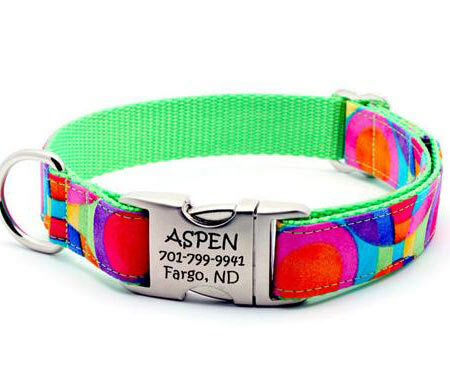 The Aspen, flashing colors dog collar, this one really pops! Hot pink, bright orange, lime green, red, blue, purple, yellow,.. Handmade Designer Dog Collar personalized with custom engraved buckle for your dog's name, ID text. From XS extra small 8 inch, up to XXl XL extra large 28 inch neck. For tiny dog breeds, extra small dogs and small puppies, small, medium, large and giant extra large dogs, up to neck size 28 inches! Handmade personalized designer dog collar with custom engraved buckle. Flashing colors, colors that pop! Flashing colors make this dog collar really pop! Hot pink, neon orange, bright green, popping purple, flashy cyan, hot sunny yellow,... Dots and circles. Colors that flash, colors that pop! Lime green webbing. Bright colors, fluorescent colors.